A Ukrainian official has denied that Kiev has tanks in the eastern Ukrainian community of Avdeevka as the OSCE claims the opposite and a BBC reporter provides video of the hardware there. With tensions in eastern Ukraine escalating over recent days, an official Kiev representative has denied the army sent tanks into the town of Avdeevka, close to the delineation line between the government troops and rebel forces. “I’ve been in Avdeevka the whole day today [Thursday]. I have not seen a single tank, I saw one police CRV [combat reconnaissance vehicle] with large letters on it clearly saying ‘Police’,” Leonid Matyuhin, official representative of the press center for the Ukrainian military in Donbass told RIA Novosti. Matyuhin countered that Burridge’s video should be verified first. On Friday, the press center for what Kiev calls an ‘anti-terrorist operation’ in eastern Ukraine, issued a statement on the presence of its heavy military in the region. It said that “with regard to some media reports on moving tanks close to contact lines” the hardware represents “an operational reserve of Ukrainian troops” aimed at responding to potential attempts by rebels to break through into the Kiev-held areas. However, the statement did not name any particular area, including Avdeevka. 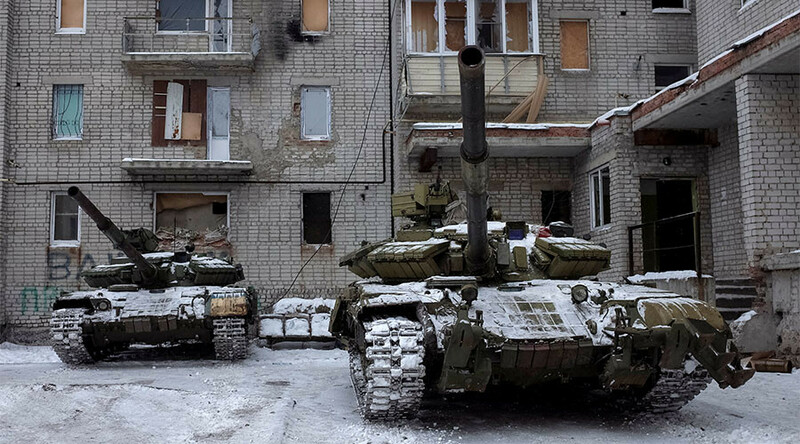 Representatives of the Organization for Security and Cooperation in Europe (OSCE) in their report published on February 2, said they had spotted Ukrainian tanks in Avdeevka, which is a violation of the Minsk peace agreements, to which Kiev is a signatory. The OSCE Special Monitoring Mission (SMM) noted “four tanks (T-64) parked behind a building in Avdiivka [sic]” which comes in “violation of the respective withdrawal lines.” The OSCE also spotted “artillery pieces” on the territory controlled by the anti-government fighters, though it did not specify their type in the report. Kiev is also trying to hush up its economic and social failures “against the background of a renewal of some conflict,” according to Putin.